It is necessary to make mention of the 'Decker Giant' Rat Terrier here. 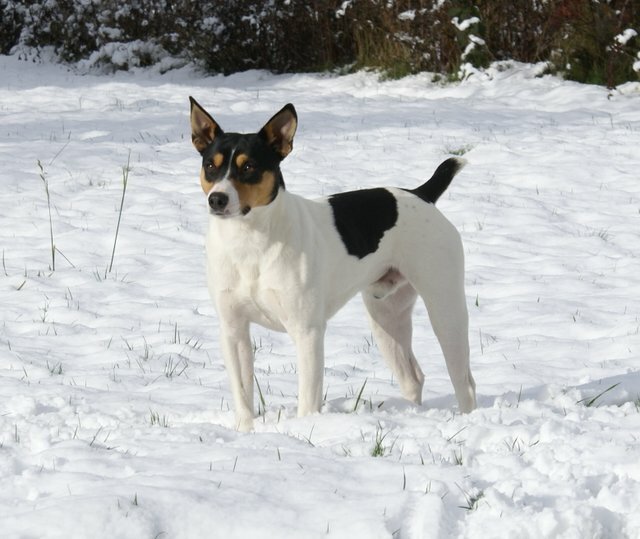 They are Rat Terriers springing from the same root as the other varieties, but they have evolved into a somewhat different dog in both size and substance as well as pedigree. The Decker, while generally a larger and more muscular dog, is still recognizably a Rat Terrier type, but is also recognizable as a dog of the Decker strains. Their primary registering body is the National Rat Terrier Association, where they are registered as Deckers. 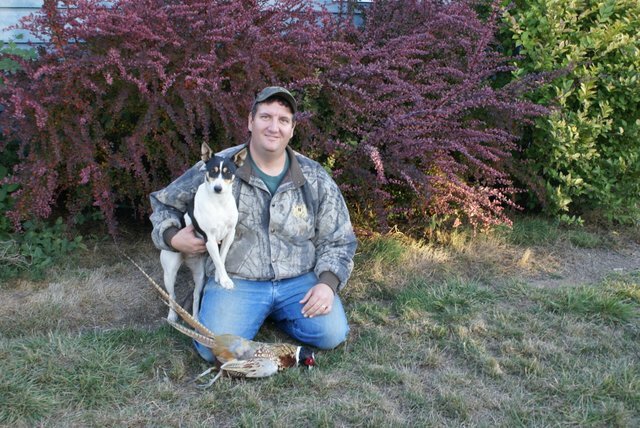 They are registerable with AKC and UKC through the Rat Terrier lineage but some will fall outside of the breed standards for exhibition purposes. The Decker people are understandably proud of their dogs, prized as much or more for their working instincts as for their appearance. The Decker has been called 'Decker Giant' by many as a way of indicating that they were a larger version of the smaller Terriers that have now become Rat, Teddy Roosevelt and American Hairless. However today they are primarily known as Decker Hunting Terriers due to their ability to hunt a variety of game aside from the traditional ratting. Milton Decker and his wife, living in Oregon, began with Henry in 1975, with a desire to perpetuate a dog that they found suited to their purposes, and as a way to instill life skills in their four children. They oversaw their children's dog activities for eighteen years, until the last child was grown and moved away, in the mid 90's. Later Ellis, the youngest of the four, decided to repeat this process with his own children, going as far away as Missouri and Kentucky to purchase descendants of Henry's offspring, and the breeding of and working with Decker Hunting Terriers continues with that family today. There are many fanciers now in the U.S. devoted to Milton Decker's 'ideal dog', and to keeping the Decker Terrier as true to purpose as possible. 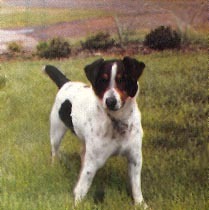 To learn more about this American Terrier visit the Decker Terrier Forum. The similarities in these dogs, aside from the ears, in both structure and substance, is a joy to see. Decker's Henry at 32 lbs, owned by Milton Decker in the 1970s. The beginning of the Decker 'Giants'. 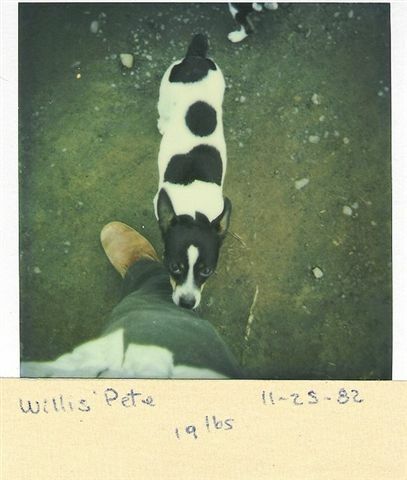 Willis' Pete in late 1982 - note the erect ear carriage. Taz in 2009, a youngster owned by Ellis Decker. Aside from the erect ears the similarities are very strong. This is Ivy in 2009, another Ellis Decker dog - proof they're not just 'ratters'!